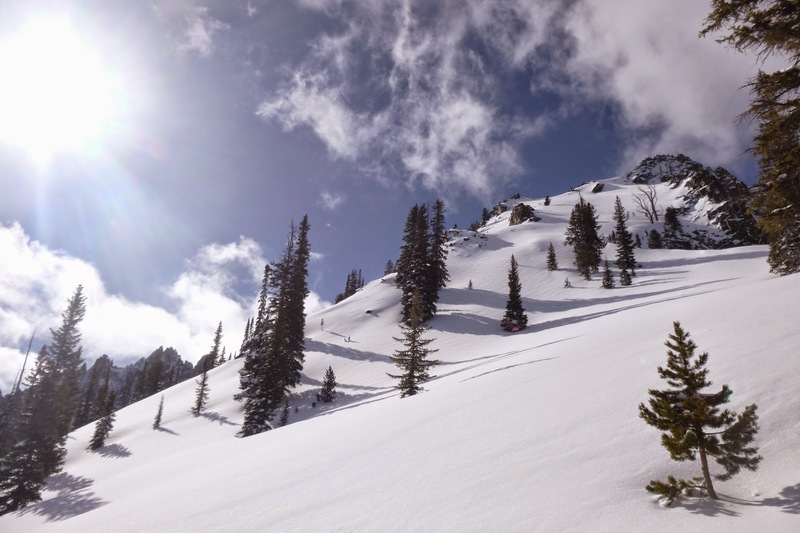 February, March, and the beginning of April have been all-time in the mountains of western Montana. Storm after storm dropped copious amounts of high quality snow in all of the regional ranges, and we are now positioned for a long and lucrative spring skiing season, as well as what is sure to be an ample runoff. Excellent news for everything except for trail running, which is yet confined to the low elevation town trails (and will be for some time, of course). 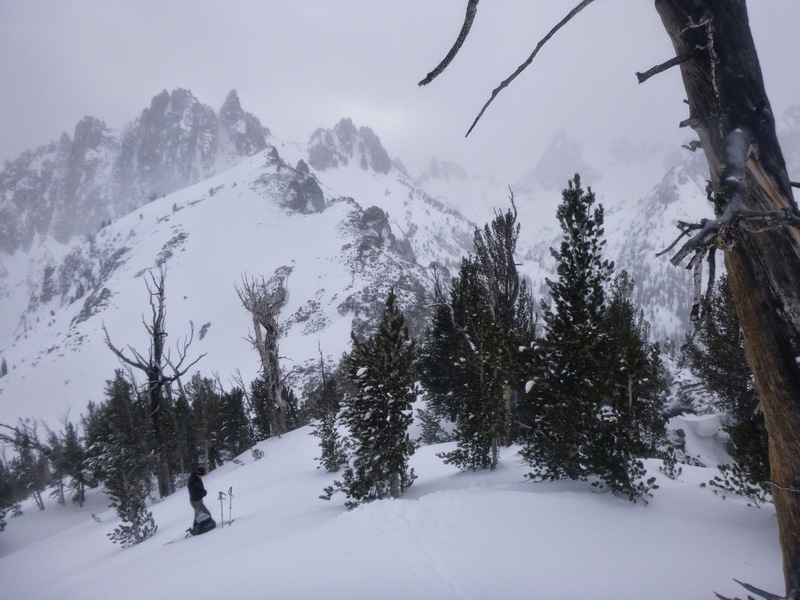 I feel as though I’ve taken pretty good advantage of all this snow, and would like to outline a few of the best ski tours that I’ve been privileged to partake in since my last posting, with stellar conditions and even better company. 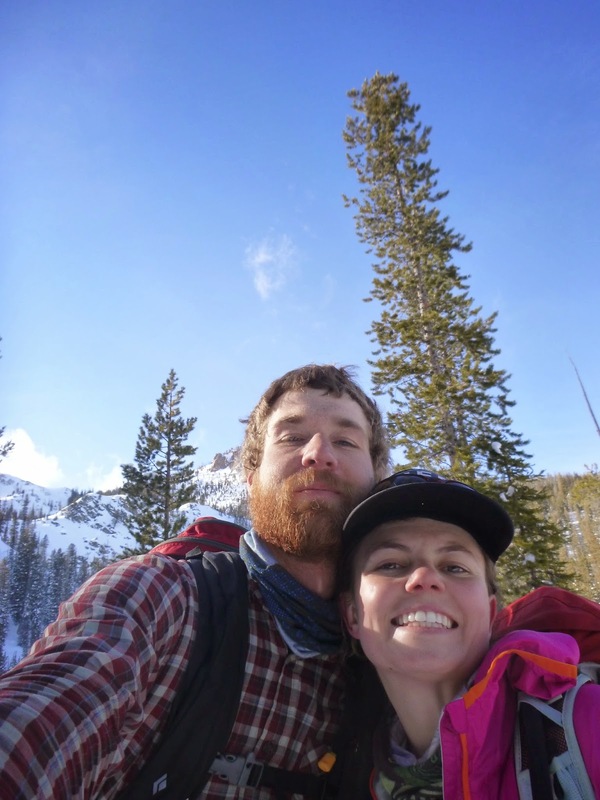 Molly and I were fortunate to be invited by our good friends Casey and Helena to spend 5 days in the Sawteeth of Central Idaho at the Bench Hut (operated by Sun Valley Trekking, LLC). 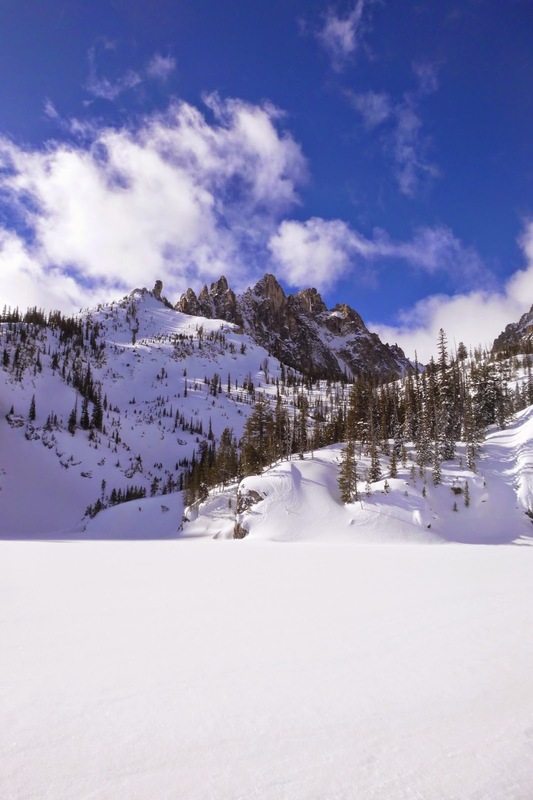 The Bench Hut sits on a high shelf overlooking Redfish Lake, in the basin of the epic Mt. 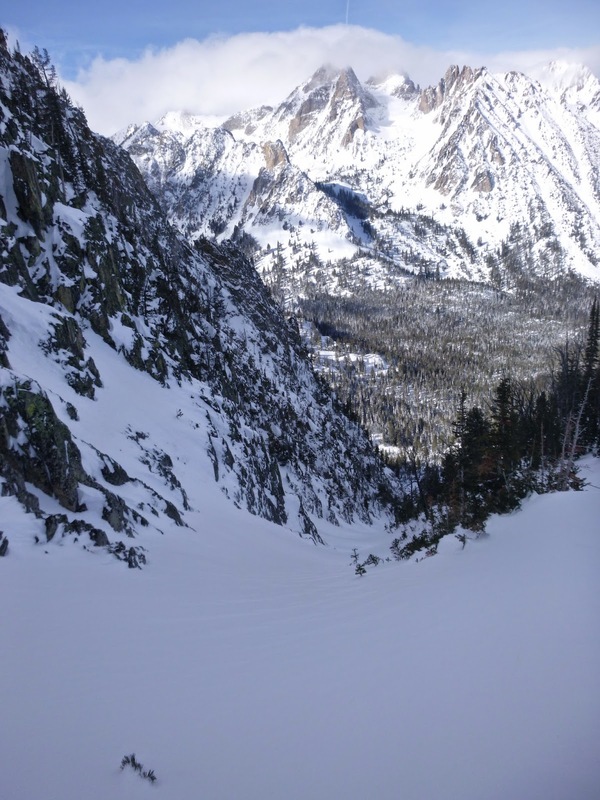 Heyburn, with its classic splitter couloir. Despite the ruggedness of much of the terrain, the lower angle hippie-pow is endless, and there is something for everyone in this zone. 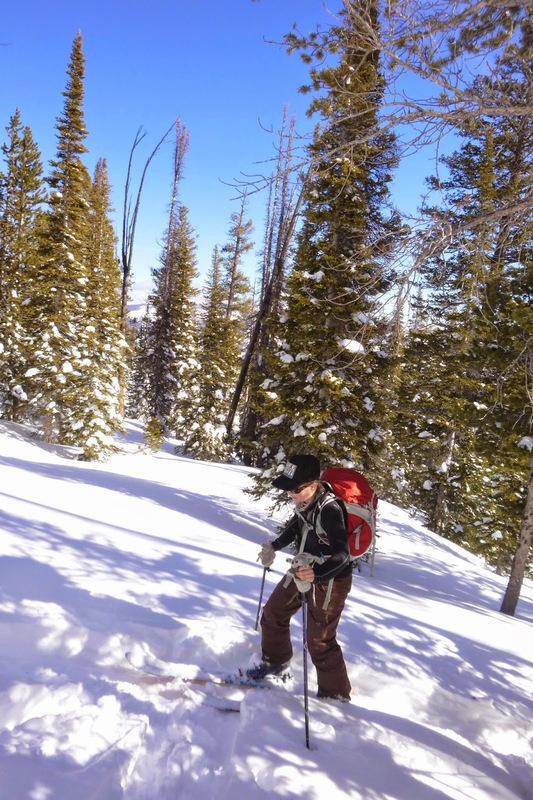 This was ideal, as it was Molly’s first time backcountry skiing (with the objective of skiing downhill, that is). Also, the two feet of snow that had fallen recently had made for somewhat nervous avalanche considerations, and being able to travel safe routes through beautiful country made the trip. We toured in the undulating six mile and 1000′ approach on a lovely clear morning. Whoomphing snow was ubiquitous. Skin track and the Grand Mogul (no moguls allowed). We skied a lap on the slopes above the outhouse (the crapper slope), and had a party, then went skiing the next day. Part of the crew wanted to look at skiing something steeper, but I just wanted to cruise around in the sunshine and look at mountains. I also took almost all of the ladies with me! We decided to check out some lower angle terrain on the opposite side of the basin. More whoomphing and a slab remotely triggered by me on a small convexity solidified our understanding that the snow was quite unstable. Thus glades and trees were the order of the day. 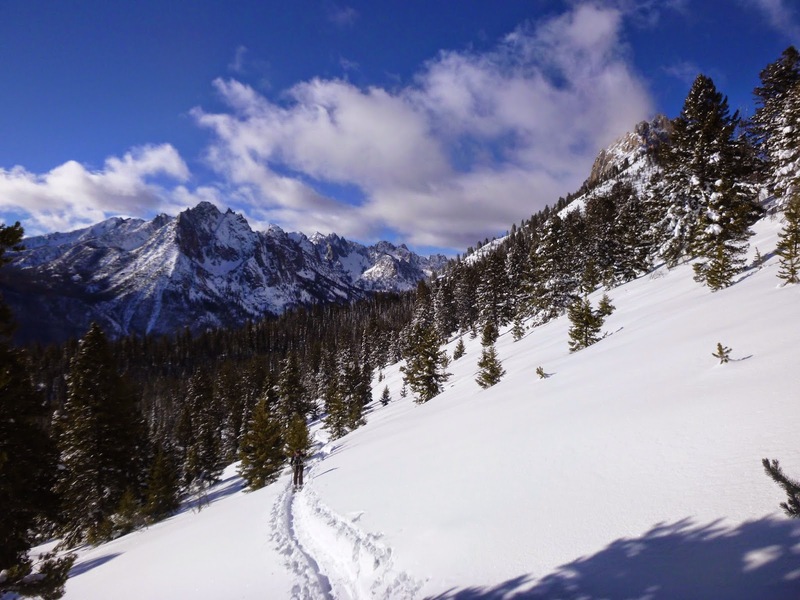 We slogged through the warming snow to the divide between the Heyburn Lakes basin and the Fishhook Creek basin to the north. Views were astounding. The Sawteeth are quite different from our local mountains, and it all felt very Alpine. This was also the dropping point for the Gunbarrel Couloir, which looked very appealing, but probably to steep and dangerous for the snow conditions. We ripped this nice glade. From the Fishhook Creek divide. Molly and I toured back to the hut after glade skiing and set what was apparently a really nice skin track, because everyone independently mentioned as such over the next few days. The snow was also stabilizing quickly with the sunshine and warmth. 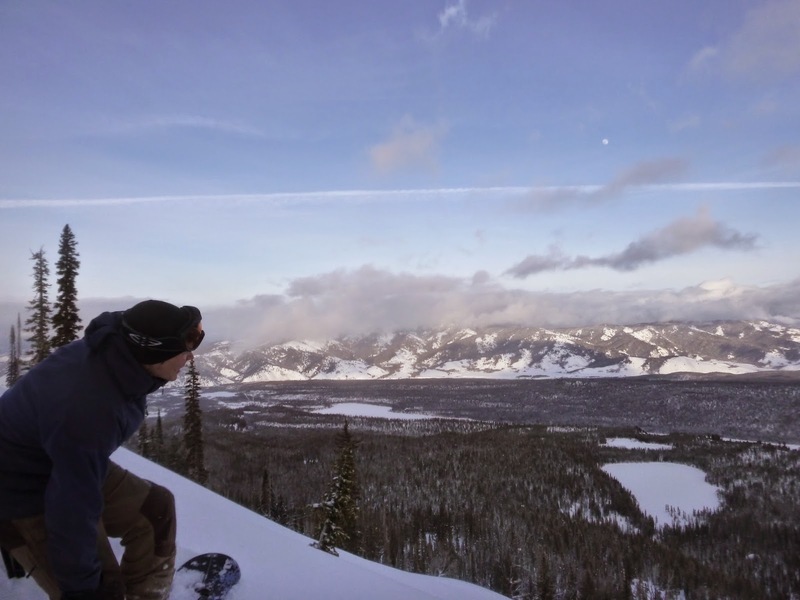 Next morning, we skied some fun powder laps on the terrain near the cabin, then Casey and I set off for a longer tour up to the base of Heyburn (which was windy and nasty), and then to the summit of Fishhook Point. The weather was deteriorating, but we still managed several long runs off of Fishhook point. I also crashed into a tree pretty hard. Near Fishhook Point AKA Dave Dog Peak. 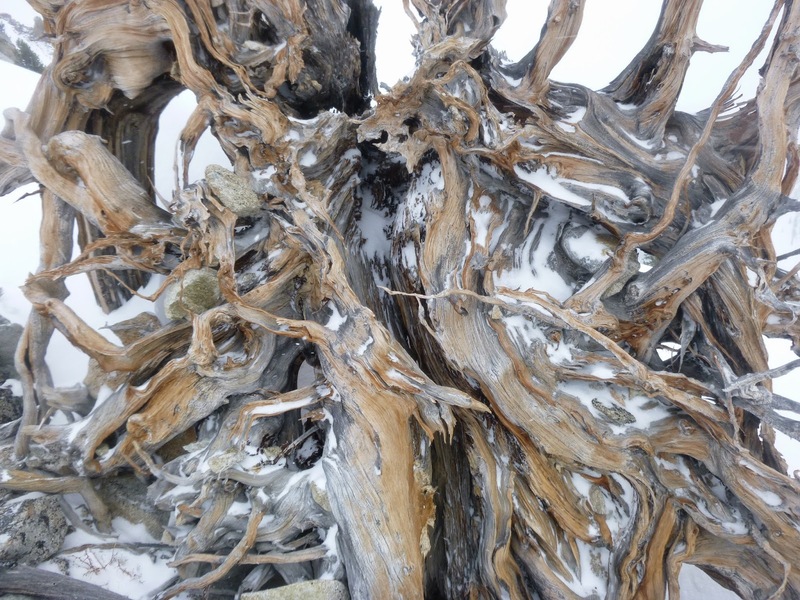 A cloudy Fishhook summit view. Casey about to rip, with an evening view of the White Clouds. Overnight, a ton of heavy and wet snow fell, increasing avalanche danger again to rather high levels. I played quite conservatively this day, mostly touring around with Molly on the local slopes, before running off to meet up with Casey for a couple of descents in the glades across the valley. One member of our crew triggered a slide on the new snow. Even more snow fell the next night, and with conditions as they were, and a long drive back to Missoula slated for the day, we opted to retreat. We ran into a group of Ketchum-ites on their way in. 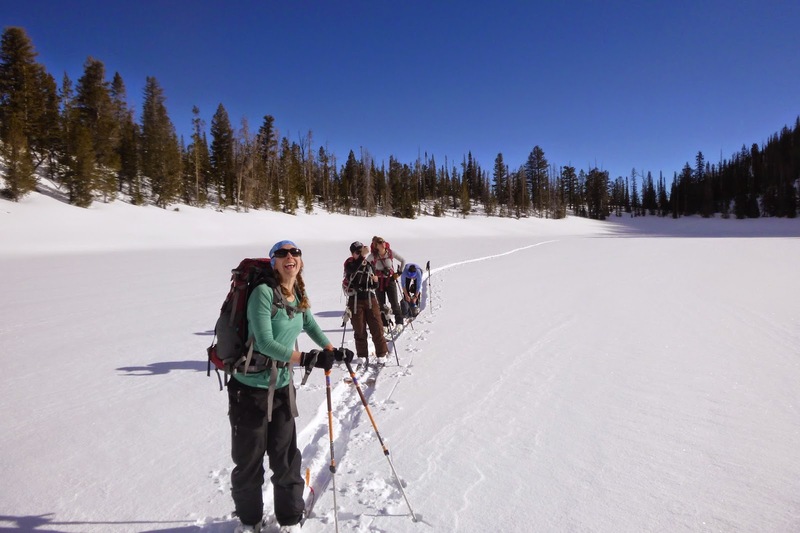 I volunteered some of our snowpack observations. Their leader responded by lecturing me with the previous day’s advisory, noting where our observations were incorrect when they did not agree with the statements of the advisory. This kind of fallacious reasoning drives me mad; I will take locally pertinent amateur observations over the extrapolations of experts over a massive area any day. It’s the kind of flawed logic that also drives people to dig a pit in one spot and declare a mountain range safe, while ignoring the weather, the wind, the aspect, the snow depth, observations of natural activity, and all other sources of information that allow us to reduce our degree of uncertainty about the stability of a slope. In my view, many backcountry travellers (particularly ones without a great deal of experience) view this information hierarchically, with a list in order of descending worth going something like: Advisory, snow pit, natural activity, everything else that’s too complicated to think about. This is wrong because the first of these is too general, the second too precise, and the third not always present even in dangerous conditions, as well as being geographically variable. 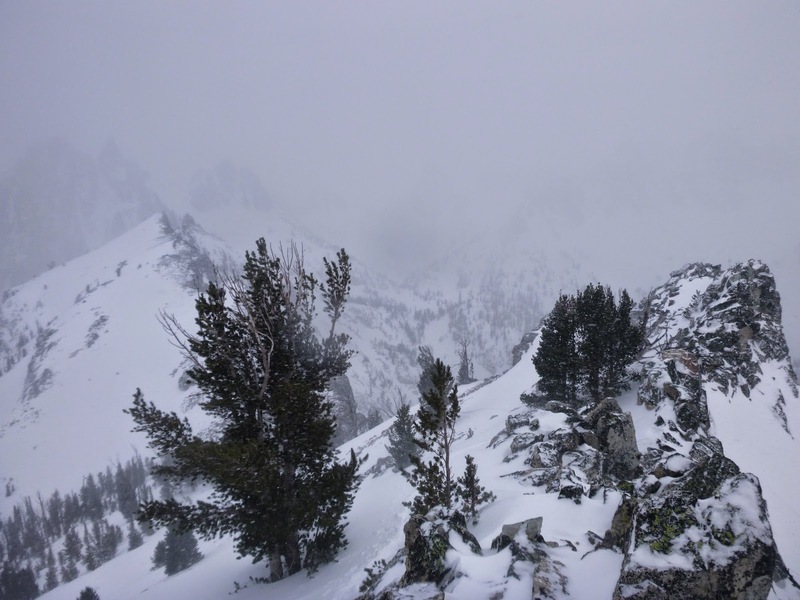 Advisories, pits, and natural activity are excellent tools, but only when combined with hypotheses formed from looking at local meteorological conditions and history affecting the formation and metamorphosis of the snowpack. It’s the scientific method: formulate a hypothesis based on general observations, then begin active testing to determine if your hypothesis is correct. And always trust your own feelers. Previous PostMissions miscellanea and Colter’s powder pen.Next PostRooting around, Pt. 2: Philosophical differences in the Swan Range. …and allow for a wide margin of error given the uncertainty inherent in snow asessment and the incalculable value of coming home alive each day. I couldn't agree more, Doug!